Food for thought for the advocates of liquid democracy. study to explore this option. Notwithstanding various advantages, we show that voice and choice by delegation also entail problems of inequality and representativeness. For those who are willing to read more than quotes and blog posts, the full paper is here [PDF]. Participatory budgeting, via which the common citizen is given the ability to interact with the elected politicians in the drafting of the local budget, became a popular political reform in Brazilian municipalities in the 1990s and attracted widespread attention across the world. This paper investigates whether the use of participatory budgeting in Brazilian municipalities in the period 1991-2004 has affected the pattern of municipal expenditures and had any measurable impact on living conditions. I show that the municipalities that made use of this participatory mechanism favoured an allocation of public expenditures that closely matched the ìpopular preferences and channeled a larger fraction of their total budget to key investments in sanitation and health services. I also found that this change in the composition of municipal expenditures is associated with a pronounced reduction in the infant mortality rates for municipalities which adopted participatory budgeting. This suggests that promoting a more direct interaction between service users and elected officials in budgetary design and implementation can affect both how local resources are spent and associated living standard outcomes. You can read the full paper here [PDF]. Update: The paper has been published in the World Development Journal. You can read the final version here [PDF]. David Karpf lecture at the American University on the impact of technologies on political activism. Karpf walked his audience through an examination of internet age advocacy organizations: examining their effectiveness in running campaigns; how they run campaigns as compared to legacy advocacy groups such as the Sierra Club (an organization that predates the internet by nearly 100 years); and what the future of the netroots movements means for the future of all who are involved in advocacy work. Karpf, who served on the Sierra Club board of directors in graduate school, came equipped with a perspective that combines the physical experience of his grassroots campaign work and the intellectual experience of meticulously mapping the behavior and patterns of online groups such as DailyKos and MoveOn. 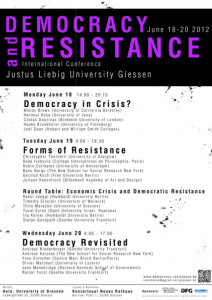 Podcasts of the “Democracy and Resistance” conference, held last June, are available here. A good start in my opinion are the podcasts of Jane Mansbridge and Yves Sintomer . Yves Sintomer: Citizen Participation – A Response to the Global Crisis? 211 Years of Political Evolution in 60 Seconds — New and Improved!! Personally, I am a strong sympathiser of democracy by sortition. Historically, the main references to government by sortition refer to Classical Athens and the Florentine Republic in the Early Renaissance. View of the Palazzo Vecchio in Florence. Picture by jrgcastro on flickr. 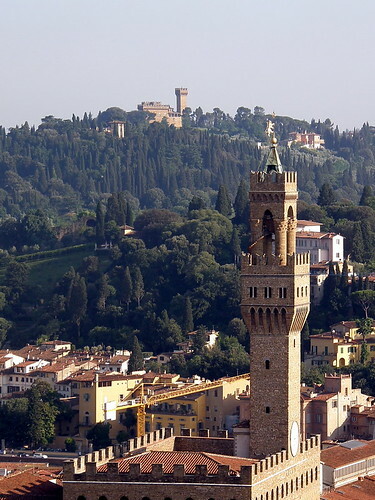 For those interested in the Florentine experience, in general less known to the public, here’s a great draft paper [pdf] by Yves Sintomer that he presented during a meeting we had a couple of years ago at the Rockefeller Center in Bellagio. In the paper, among other things, Yves describes the experience of the Florentine Republic and contrasts it with recent democratic innovations based on random selection. As to these recent experiments, alongside citizens’ juries, probably one of the most studied experiments with sortition in recent history refers to British Columbia’s Citizens’ Assembly on Electoral Reform. At a time when citizen participation is considered – at least in theory – an important part of the open government movement, those working in this sphere should pay particular attention to different methods of participant selection (e.g. self-selection, randomized) and what the prospects and limits for each of these different methods are. An awesome read on this subject is the book Democratic Innovations by Graham Smith. Among other things, Graham looks at the impact that different institutional designs (and methods of selection) have on the inclusiveness of participatory experiences. If you are interested in sortition, a good resource to follow is the Equality by Log blog. In the blog I just came across an interesting presentation [PDF] by Yoram Gat on the subject of sortition compared to traditional (i.e. representative) democratic institutions. Maybe after some of these readings you may become a sympathiser of government by lot as well. picture by Teseum on flickr. Does democracy help babies survive in sub-Saharan Africa? By using retrospective fertility surveys conducted in 28 African countries, I compare the survival of infants born to the same mother before and after democratization to identify the eﬀect of democracy. In measuring democracy, I adopt a theoretically motivated deﬁnition of democracy: universal suﬀrage and contested elections for executive oﬃce. I ﬁnd that infant mortality falls by 1.8 percentage points, 18 percent of the sample mean, after democratization. 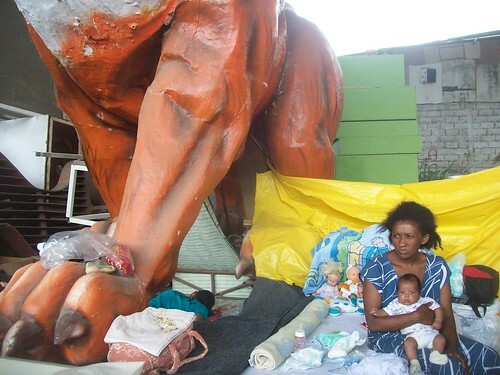 The size of the reduction is larger for babies born to mothers from disadvantaged groups. I also ﬁnd that the replacement of a chief executive by democratization is the driving force behind these results. Additional evidence suggests that improvements in public health service delivery, not an increase in aﬄuence, are the key mechanism in which democratization has reduced infant mortality.